Ada is 10 years old and has never set foot outside her apartment. Because of her club foot, Ada is confined to the indoors, where she is trying to learn to walk and spends most of her time looking out the window, watching her younger brother Jamie play and waving to the neighbors. When the children of London are evacuated to the countryside, only Jamie is going to be sent. But, Ada's tired of a life of abuse and sneaks away to be with Jamie. When they arrive at their destination, nobody chooses the two children so they're left with a single woman who doesn't want them. Susan Smith is depressed after a devastating loss but she's kind. She keeps the children well-fed, clean, and nicely dressed. Both children are traumatized and lacking in education. Ada has never even felt a blade of grass, much less learned her ABCs. While Ada teaches herself to care for Susan's horse and ride it, Susan begins to instruct the children in life and eventually teaches them to read, showing them what it's like to be cared for in the process. But, what will happen when the war ends? Will they have no choice but to go home to their abusive mother? 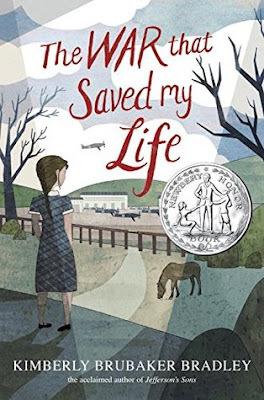 Highly recommended - I can see why The War that Saved My Life is a Newbery Honor Book. It's a lovely, emotional story and you can't help but get caught up in the lives of the children and admire Susan for her gentle way of caring for them and dealing with their response to trauma. She's flawed but immensely patient. I know it's fiction but I've read so many tales of how evacuated children were badly treated that it was refreshing to read a story that's about how much difference kindness and patience make in the lives of children. You also get a good feel for the experience of WWII in their little village: the airfield nearby, the fear of German spies and potential bombing, the sheer terror when the bombs finally fall. A wonderful story with a beautiful ending. There's a sequel to The War that Saved My Life and I hope to read it, someday. I learned about the books in reverse order. A friend mentioned reading The War I Finally Won on Facebook and when I looked it up, I discovered that not only was it a WWII book (my favorite time period!) but a sequel. So, I backtracked and read about The War that Saved My Life. And, then, of course I bought it because of the WWII setting. Another book that made me cry happy tears and a new favorite children's WWII book, one I'll be thinking about for a long time, no doubt. Sounds like one to add to my TBR. I hope you enjoy it as much as I do when you get to it, Jenny! Several of my former coworkers raved about this book and I keep meaning to get a copy, but haven't done so yet. I'm glad to hear that you enjoyed it so well. Adding it to my library list! Again! I'm not surprised about the raving. It is an exceptional book. I thought she did such a great job of setting the war background, showing how children react to trauma, and also showing growth of the characters. Not to mention, it's just an all-around good story. I think you would love it, Les.